Instead of listing song lyrics, I'm just going to try to turn you on to a new band. A boy band. Actually, they're not "new" since they were around and huge back in the early 90s. Back then, I knew one of their songs, but would've never known who sang it. 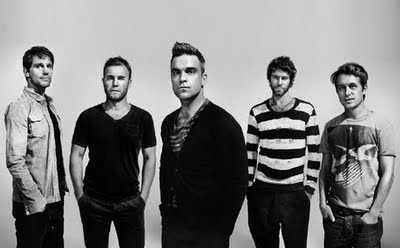 It wasn't until the late 1990s when Robbie Williams caught my attention that I even knew of the band Take That. And all I knew was that he had left them and there was a lot of bad blood. I was instantly sucked in. Immediately, I was madly in love with this song. The song is a single off the expanded album, "Progressed" and I immediately emailed Puff to tell him I wanted the album for Christmas. (Although, I was so obsessed with that song, I broke down and bought it for myself a few weeks ago!) So, this is my public admission that I do enjoy some boy band pop music on occasion. But when you have a "man band" that looks THIS smokin' hot, who can blame me?